First of all, let me just say that my hands are still on fire, almost 24 hours after touching my last pepper. They didn't seem particularly spicy, but my skin is telling me otherwise. So, it was a very peppery weekend. Using a pound of peppers was actually easier than I thought it would be. I also had some help from our cat, but more on that later. I had to make a salsa. 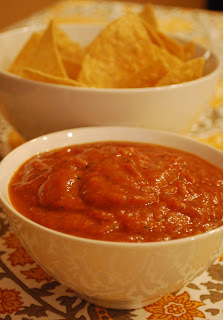 Typical, I know, but I'm a bit of a salsa snob and it's hard finding any store-bought that I like. I put the tomato and garlic cloves under the broiler to soften/roast for about 10 minutes. (The garlic should pop right out of the peel once it's roasted.) The peppers went onto the grill whole to blister and char. Once they sweated in a covered bowl for a while, I peeled them. Then all the ingredients went into the blender to puree. (If you like it chunky, you could use a food processor and just pulse a couple times instead of pureeing.) I added another bit of cilantro, and a lot more salt. The finished product had a bit of sweetness and then hit you with some fire in the back of your throat for the finish. Nothing too fancy here. Just chop up some peppers and heat them in some olive oil. Heat for about 5 minutes, then remove from heat and let the peppers sit in the oil for about an hour before straining. The peppers I used were pretty mild, so it gave the oil a very subtle hint of chile. I made a white wine vinaigrette with the oil and tossed it with an arugula salad with sliced raw peppers. 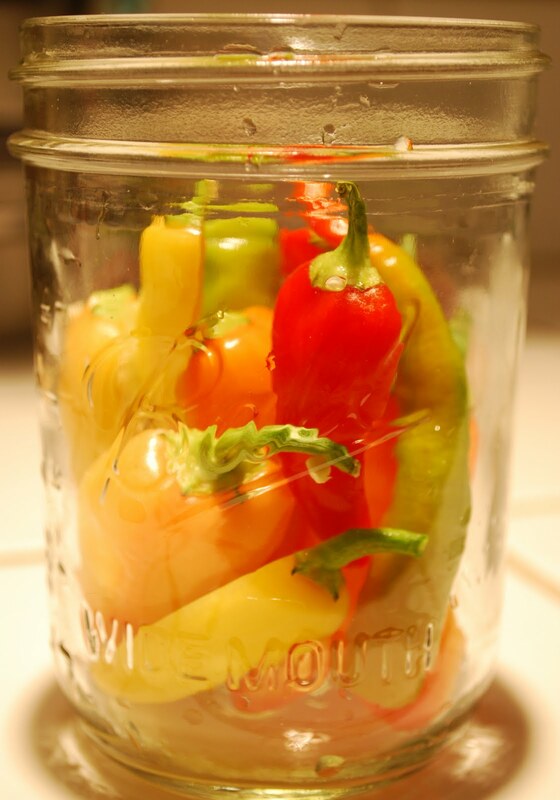 Pickling seems to be all the rage right now. I've never pickled before, but have been seeing pickled everything pop up in dishes and wanted to give it a try. I checked around to see what one does when pickling. Again, it looked like you could really do anything you wanted, so long as you added vinegar. What I ended up with was white vinegar, water, a garlic clove, a handful of peppercorns and coriander seeds, sugar and salt. It seems like these are pretty typical flavors for pickling. After heating all the ingredients to a boil and simmering for a few minutes, I poured the mixture into my jarful of peppers. The jury is still out on this one...they won't be ready for about a week. I read that you don't have to wait that long, but the more time the better. I'm willing to wait, but every time I open the refrigerator I'm very tempted. Another classic for peppers; this turned out to be a great side dish for a barbecue dinner, and was one of my favorite uses. To make the stuffing, saute some ground beef, grated onion, minced garlic and fresh thyme. Season with salt and pepper. Off the heat, stir in cooked white rice and crumbled feta cheese. 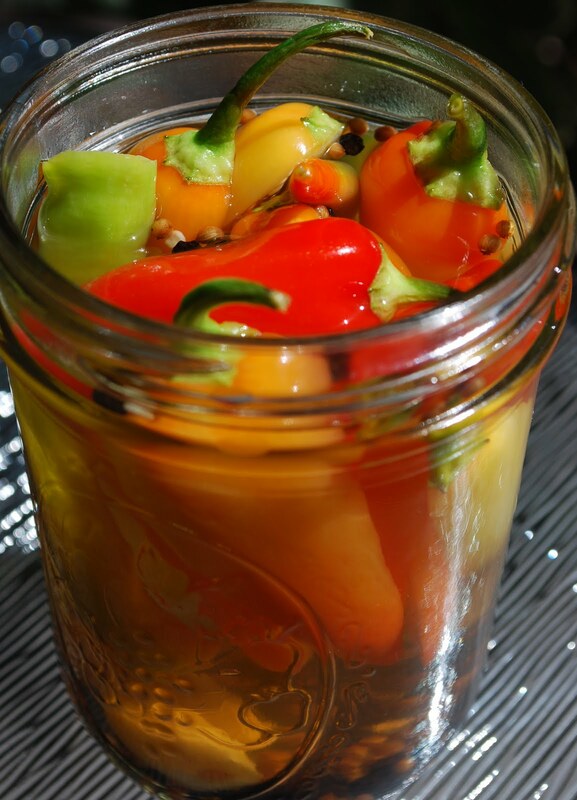 Cut a variety of different peppers in half lengthwise and seed them. Fill each pepper with the stuffing mixture. These can be made ahead to this point. Let me suggest however, that you do not leave them on the counter for your cat to eat. Yes, our cat sampled the stuffed peppers. She is very mischievous (read: bad) and managed to jump onto the counter, knock two halves onto the ground and scarf down all the stuffing and part of one pepper without anyone noticing. Thankfully, she didn't choose the hottest pepper variety, and seems no worse for the wear. After the cat is done tasting and you're ready to eat, grill the peppers for a few minutes until they are slightly blistered on the bottom and softened. There are still a handful of peppers waiting to be used. An infused vodka was suggested…maybe it will find its way into my next Bloody Mary. Wow! That was fast. ;) I'm tempted everytime I pickle peppers too. I've tried them sliced, halved and whole. They always look at me funny and try to get me to open the jar early. Your cat has good taste! Great post! 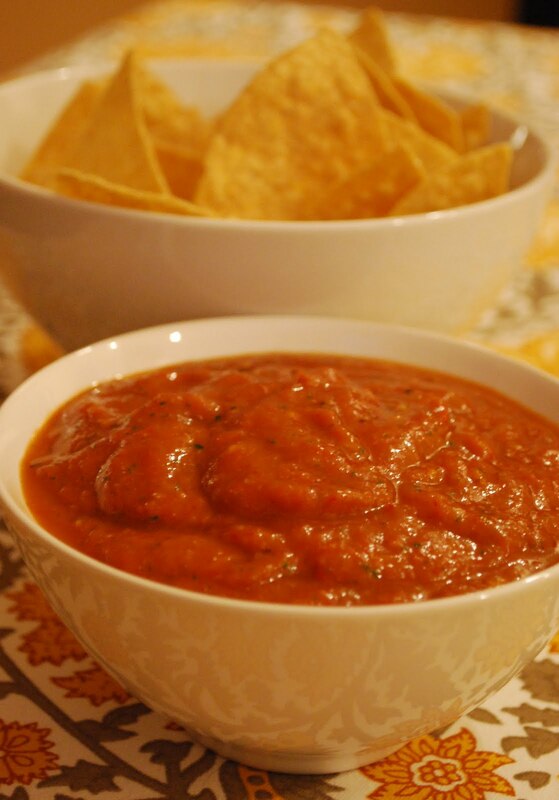 Oooh I love pepper recipes, these sound great - especially the roasted pepper salsa!